= Matucana haynei subs. hystrix var. atrispina Rauh & Backeb. Origin and Habitat: Nazca to Lucamas and adjacent areas, southern Peru. Altitude: Around 3500 metres above sea level. Description: Matucana haynei subs. hystrix var. atrispina is one of the geographical form of the morphologically variable Matucana haynei subs. hystrix. Matucana haynei subs. hystrix var. atrispina distinguishes from the standard Matucana haynei subs. hystrix for the even more robust blackish central spines, which are ash-grey and conspicuously swollen at the base. 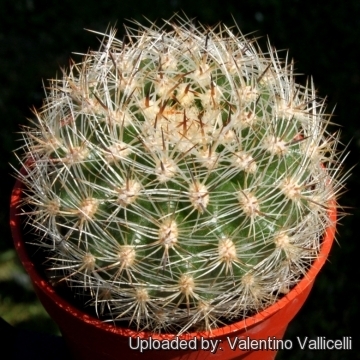 Habit: It is a globe-shaped to shortly columnar cactus densely covered by white-greyish, hair-like spines. The purple, tubular flowers project beyond the spines and present a most attractive appearance at flowering time. Stem: Generally single but occasionally many-stemmed, globular to shortly cylindrical, 8-10 cm in diameter, up to 30 cm high, green, densely covered and almost invisible under the numerous spines. Areoles: Set closely together, with an abundance of wool when young, but without any when old. Spines: Variable, white to pale brown, grey with age. Central spines: Up to 4 stouter, pungent, up to 5 cm long, more or less subulate and thicker at the base, blackish and paler at the base. Radial spines: Numerous 1,5 cm long more or less pectinate, weak, bristly, glassy white to yellowish brown. Flowers: Apical, dark crimson, up to 7 cm long and 2,5-3,5 cm broad, bilaterally symmetrical to nearly regular, limb scarcely oblique, with a long slender tube; scales on ovary and tube few, small, ovate, naked in their axil. The segments acute, purplish crimson. Filaments bright carmine , anthers yellow. Style bright carmine, stigma-lobes greenish. Fruit: Small, spherical to club shaped light reddish-green about 1 cm in length. 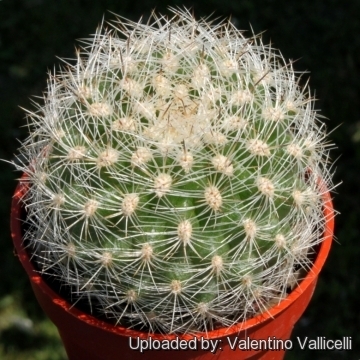 Matucana comacephala F.Ritter: (subs. myriacantha) has solitary globular to cylindrical stems with cream-coloured spines and large pink to sometimes orange-red blossoms. Distribution: Ancash, Cordillera blanca, Peru. 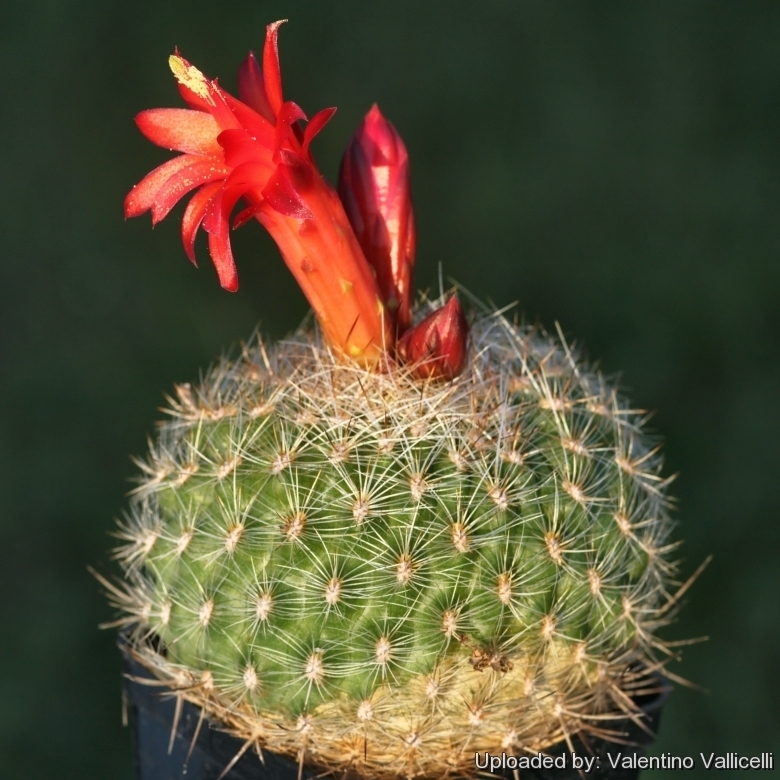 Matucana crinifera F.Ritter: (subs. haynei) stem densely covered by yellowish-white, hair-like spines and showy blossoms, white at the bottom pinkir to red on top. Distribution: Machac, Ancash, Peru. Matucana crinifera f. cristata hort. : (subs. haynei) Crested form. Matucana haynei (Otto) Britton & Rose: (subs. 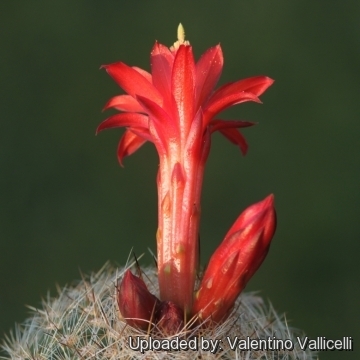 haynei) has stems to 30 cm high and at least 30 spines: Distribution: Matucana. Matucana haynei subs. herzogiana (Backeb.) Mottram: usually less than 10 cm high with relatively few, more or less curved, setaceous spines. Distribution: Cordillera Negra. Matucana haynei subs. hystrix (Rauh & Backeb.) Mottram: has cylindrical stems to 30 cm high, 4 distinct dark brown central spines, and numerous radials. Distribution: Nazca, Ica, and Lucanas, Ayacucho. Matucana haynei subs. hystrix var. atrispina Rauh & Backeb. : like Matucana haynei subs. hystrix but with more robust blackish spines, ash-grey and conspicuously swollen at the base. Distribution: Nazca to Lucamas and adjacent areas, southern Peru. Matucana haynei subs. myriacantha (Vaupel) Mottram: has very short stems, rarely more than 8 cm high, and as many as 10 central spines and 25 radials. Distibution: above Balsas, Cajamarca. Matucana multicolor Rauh & Backeb. in Backeb. : has multicoloured spination. The central spines ranges from amber, to black-brown, to black-violet, or nearly white. Distribution: Nazca-Puquio road at about 4,100m ASL. 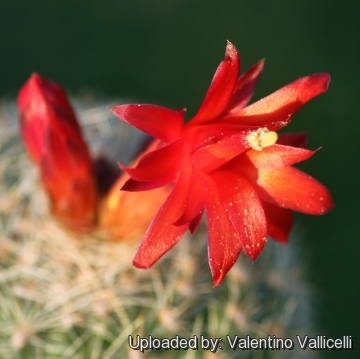 Matucana myriacantha f. roseoalba (hort., F.Ritter) Lodé: (subs. myriacantha) has dense cream coloured spines cover almost completely the plants body. Flowers are glossy pink and white, tubular and zigomorphyc. Matucana variabilis Rauh & Backeb. in Backeb. : (subs. haynei) It has thin variable spines (cream to amber coloured) suggesting the epithet. Distribution: Ancash, Peru. Matucana villarica n.n. : Brewster County, Texas, USA. Matucana yanganucensis Rauh & Backeb. in Backeb. : (subs. haynei) Same as Matucana haynei. Exposure: It is suited for sunny-brightly exposure, but can tolerate light shade. However it will do its best only with lots of sun and become stressed with inadequate light which could result in poor growth and unnatural shape. Direct sun is also beneficial in order to get a good spine coloration.